In this book Naila Kabeer explores the gendered dimension of risk, vulnerability, and insecurity and hence the gendered need for social protection. 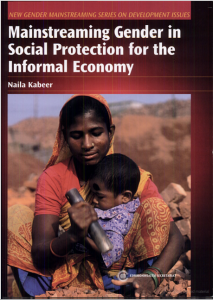 Her emphasis is on the informal economy because that is where the majority of women and, indeed, the poor are to be found, but it is also here where official efforts for social protection are limited.The book will enhance understanding of the constraints and barriers which confine women to more poorly remunerated, more casual, and more insecure forms of waged and self-employment, and considers what this implies for women’s ability to provide for their families and cope with insecurity. Kabeer assesses the different kinds of risks, vulnerabilities and insecurities associated with the pursuit of livelihoods in the informal economy and how these vary by gender. She considers different kinds of informal activities (entrepreneurs, home-based workers, petty traders, and waged labor) with varying degrees of formality, and distinguishes between urban and rural locations. Finally, she sets out policy guidelines for those interested in advancing the social protection agenda and ensuring that gender issues are appropriately addressed.